I am beginning to think that winter is never going to end. The days and nights are so cold and most days offer gray skies and snow. I know I have been complaining a lot about the winter this year, but I really really am so tired of it. Oranges and carrots are not a combination I would normally consider in baking goods, but I wanted something a little different and this was definitely different for me. 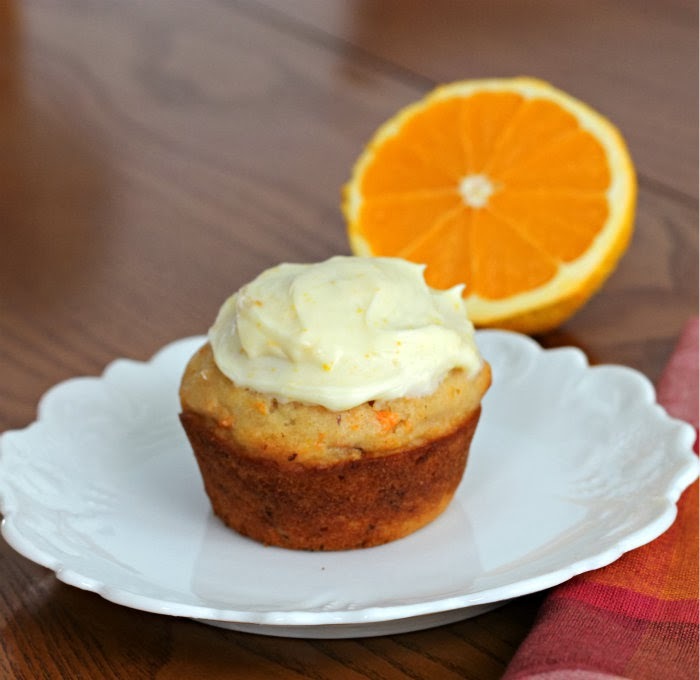 The muffins turned out to be wonderful; the flavor of the carrots and oranges went very well together. 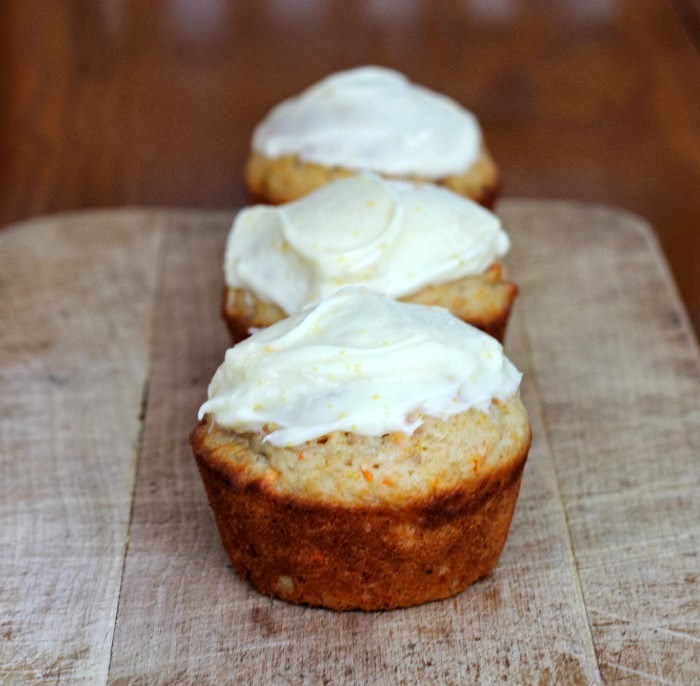 They are topped with a cream cheese frosting that is blended with orange rind and juice for a bit of sweetness. To tell the truth the muffins are great without the frosting so if you want to save a few calories or not too much into frosting, don’t add it. 2. Combine the flour, sugars, carrot, walnut, and orange rind in a large bowl. Combine the egg, buttermilk, and oil in another bowl and whisk to combine. Add the egg mixture to the flour mixture and gently stir until just combined (do not over-mix). 3. Spoon mixture evenly among the prepared pans. Bake in preheated oven for 20 to 22 minutes or until a toothpick inserted comes out clean. Remove from oven and set aside to cool. 4. Meanwhile, use an electric mixer to beat the cream cheese until light and creamy. Add the orange rind, juice, and powder sugar and beat until well combined. Spread the cream cheese mixture over the muffins to serve. 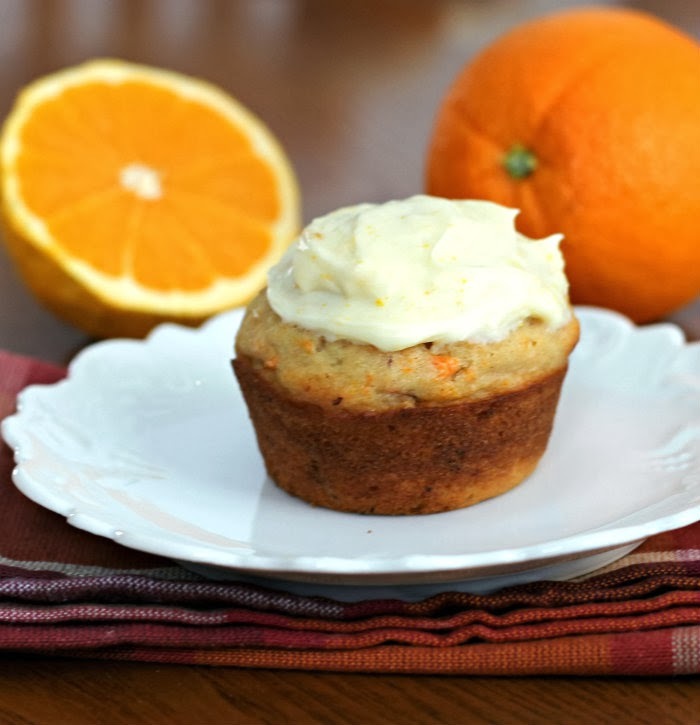 We must be thinking similar thoughts, I just made my family some orange muffins this weekend. Yours are very different from what I came up with so I’ll have to give yours a try as well. This has been a cold, snowy winter — much worse than usual. I like cold weather, but enough is enough! Anyway, love these muffins. Super flavor. and so comforting in this sort of weather. Citrus definitely does brighten up these gloomy winter days! What great muffins!